Let me be perfectly frank about something regarding this book: I was extremely resistant to giving it a try for a very, very long time. Part of that is due to the fact I tend to have such bad luck with sci-fi novels. The other part is that while I love fairy tale retellings, Cinderella has never been a story that resonated with me very strongly. As such, a lack of any interest in this was what I faced, and the more I saw people talk about it for years, the more I would tell myself I wasn't interested and wouldn't ever pick this book up. And in 2012, I don't think I would have been as open or as appreciative of this book when it debuted. But you know, books are funny things. I'm not sure how often it is that other people experience this, but there will be times where covers and/or synopses will catch my eye and, even if I don't want to or feel like picking up said book and reading it right away, the thought of it will remain in my head for a long time going forward. As you can probably guess, this happened with Cinder. Maybe it's the romantic in me, but I firmly believe that sometimes books that stick in our minds tend to come back to us and we will decide to read them at pivotal points in time that can either make or break the experience of reading them. Such an occurrence is the reason I'm typing this review; six to seven years ago, this was not a book I wanted to read, nor was the character one I think I could have related to in most capacities. 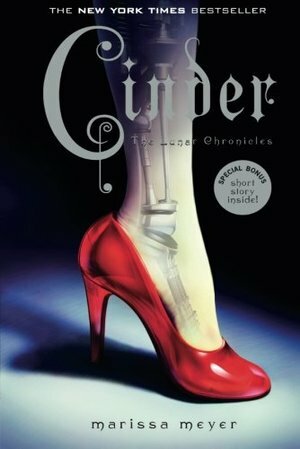 As it stands, I am glad to finally have read it, and while I still can't say that I necessarily relate to Cinder in all ways, I do think I can relate to her on some level and I definitely enjoyed her as a protagonist. Marissa Meyer did an excellent job with this book; the world-building is spectacular without being immediately overwhelming. The characters feel believable and while perhaps not fully compelling or relatable, I did find them sympathetic and intriguing. The politics feel like they're just on the cusp of being fully explored, and the pacing of the book moved fairly quickly but still flowed smoothly, all things considered. Will I be going on to read the rest of the series? Oh certainly! Not right away perhaps, but this book was a treat, and I intend to indulge more when I am able to. This is a very fun book. I really love the tie in to CInderella and the plot line was very interesting. I love how real Cinder is and how she connects with other people. A really interesting retelling that doesn't fall into the trap of simply redressing the exact story and becoming entirely predictable. It was hard to put down towards the end, and the protagonist was lovable and relatable. The conflict between Earthen and Lunar did not feel contrived, but rather believably complex and nuanced. The Lunars' glamour was not overdone and a simple deus-ex-machina, as it so easily could have been. And the cyborg element was probably my favorite, most masterfully executed addition. The eastern setting felt respected, and didn't distract from the story itself (as many authors get so wrapped up in explaining their world they forget the plot it exists to carry). Overall, very well done! I remember seeing this book when it first came out and thinking there was no way I'd ever like something like that. It's a good think I got out of my own way because I have never been more wrong about a book. I absolutely adored the characters and loved the fast pace of the story telling. It was brilliant. In case you haven’t figured it out, this book is a retelling of Cinderella. In fact, the whole Lunar Chronicles series are retellings of fairy tales in a steampunk, sci-fi kind of way. I love retellings and this one was so unique! I am a big fan of steampunk, so to read a book that combines that AND fairy tales!? OMG!!! This book was AWESOME! I loved the good characters, the bad characters, the androids, the plot, everything! There was a great cliffhanger at the end, not so much that there wasn’t closure, but now I NEED to read Scarlet to see what happens! I agree with some other reviewers that it was predictable, but I really liked the world and the characters, and it was very fast paced. Counts for "Young Adult" challenge on Summer Reading.